The Bella Playa, Cala Ratjada is one of the resort's most popular hotels. It's location on the edge of the resort, allows quick access to the local golf courses; Capdepera, Son Servera, Pula & Canyamel. 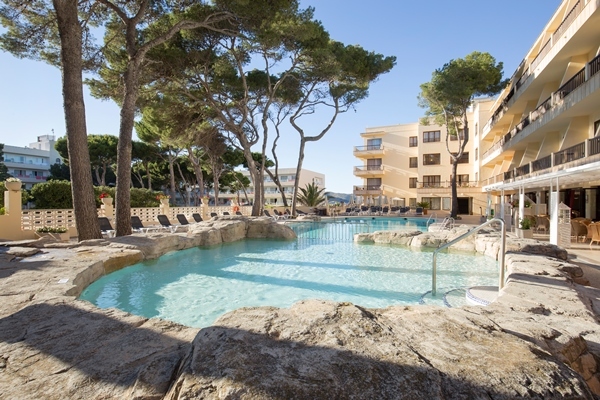 The Bella Playa hotel is located just a few minutes walk from Cala Ratjada's largest beach, Cala Agulla. It's one of the resort's oldest hotels, and has been a firm favourite, particularly with German golfers, for many years. The hotel comprises of over 200 rooms. Each room has air-conditioning / heating, a full bathroom, a hairdryer, a safe, a minibar, a digital satellite radio and tv, a telephone and an alarm clock. The hotel is equipped with wi-fi throughout. It has a 24-hour reception, and is air-conditioned in all of the common areas. The Salon Nereida is located next to the swimming pool, and comprises of the hotel's bar and cafe, an entertainment stage, a television area, and a large outdoor terrace. The cafe serves light food, snacks and lunch from 12:00 until 15:00 daily. Entrance into the hotel extensive Spa is free of charge and for the exclusive use of the hotel's guests. It is equipped with the latest facilities. The Spa's modern swimming pool has thermal hydro-massage, bubble loungers, Jacuzzi, counter current exerciser, waterfall, and a cool off pool. The spa also offers a grand sauna with views of the pool, two Turkish baths, aromatic cyclone showers, an ice fountain and a special relax room with soothing music and low intensity lighting. The Wellness area offers many spa treatments, and body / facial massages, which are provided by knowledgeable and professional members of staff. There is also a fully equipped fitness centre, and four clay tennis courts to help keep you in form during your stay. There may be additional charges for some of the facilities mentioned. This 4 star hotel has been popular with tourists to the resort for many decades. Its policy of constant innovation and renovation has ensured that it's moved with the times. The staff at the hotel provide a genuine and individual level of service that gives the hotel a friendly and family run feel. Whilst there are plenty of bars and restaurants nearby, the main centre of the resort is about a 10 to 15 minute walk from the hotel, however, this does ensure that it is quiet and peaceful around the hotel during both the day and the night. The resort of Cala Ratjada is almost exclusively German, so expect this to be spoken as the first language, followed by Spanish and then English. There aren't any English pubs either, but the German bars do serve a good beer!